At 17, I headed out to North Wales with a friend who promised us his three day RAF climbing course meant he could safely multi-pitch and my boyfriend of the time who had never climbed before but would never back down from a challenge. Apart from indoor top roping with my dad when I was about twelve, I’d never done any climbing to speak off. Our friend picked out a line which can’t have been harder than a Diff and my boyfriend lined up to do his first lead. It was a very easy amble, but I remember being nervous especially after the first two pieces of James’s gear fell out of the rock once he’d climbed past them. Fortunately, no accidents happened and the second pitch was easy-peasy. We were all hooked but I thought it was probably a good idea if I learnt how to climb from someone who had maybe had a few more days on the rock. Fast forward two years and I joined the Leeds University Mountaineering club. There I met some amazing friends who were really generous with their time and expertise. Soon however I leant about the mysterious category of the ‘social climber’ – a phrase which rather than having anything to do with social ambitions, referred slightly derogatively to an individual’s desire to climb because they liked hanging out with mates outside, rather than because they had any specific route ambitions. I probably fell into this category. Pub conversations suggested many of the girls in the club fell into this category, and I quickly realised this wasn’t generally regarded as a good thing! Personally, I wasn’t getting better at climbing because I wasn’t leading, and I wasn’t leading because I was usually the weaker member of a climbing partnership and the more risk averse. It was always too easy for me to back off and let someone else lead, or agree to climb a more exciting route on second than fight to climb a ‘soft’ route on lead. 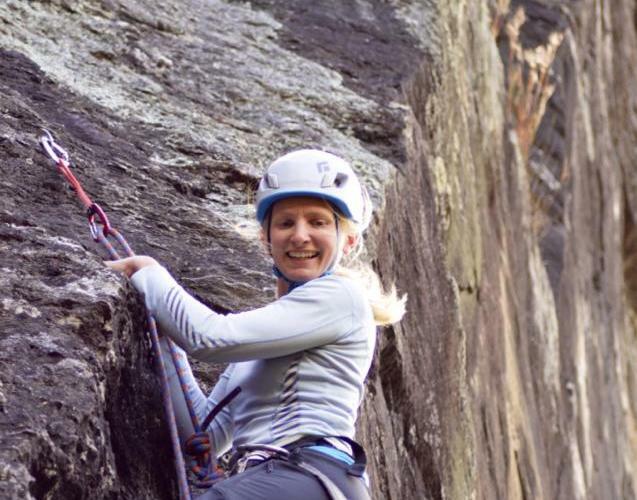 I’ve talked to other female climbers, and often this is a familiar experience. This year I’m trying to change my approach. On a personal level, I want to have my own challenges to work towards and overcome. I want to climb with more confidence which means working on my head game as much as my strength and technique. The feminist in me also wants to change this trend on a bigger level. I want other people in alpine huts to stop assuming that my boyfriend is my climbing guide. I would like more female climbing partners because as one of my friends said ‘just seeing that girls can be just as capable and ballsy as the guys is really inspiring’. It’s worth mentioning at this point that I don’t think that climbing culture is anti-women, quite the reverse, all the guys I’ve ever climbed with have been really supportive (bar the usual climbing banter), and magazines always seem to be looking for female climbers to celebrate. 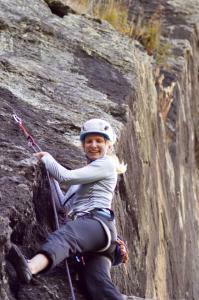 Nearly all my female climbing friends first began their climbing career with guys. But still there is a huge disparity between the numbers of male and female climbers, even more so in Alpinism than other forms of the sport.